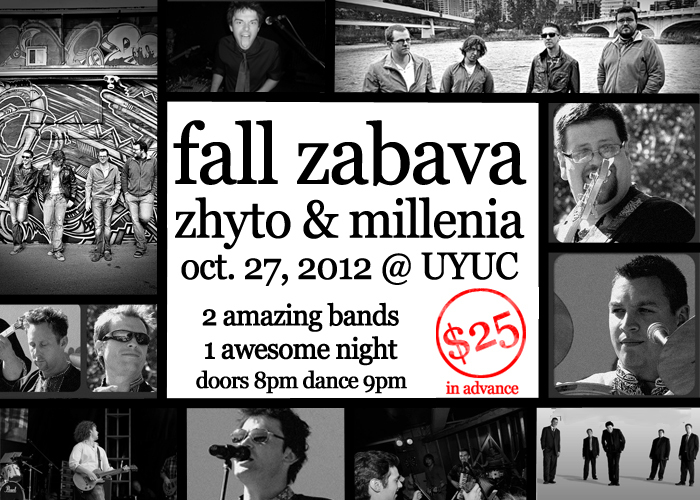 The Verkhovyna Ukrainian Song & Dance Ensemble is proud to announce and invite you to our annual Fall Zabava - featuring bands Millenia & Zhyto. On October 27th, 2012, join us at the Ukrainian Youth Unity Complex for a night of fast polkas, good drinks and fun times. Doors open at 8PM, and the bands get going at 9PM. Tickets are $25 in advance, $30 at the door (includes a late lunch). Minors are welcome to attend! Please contact Breanne @ 780-457-4545 for more information or to reserve your tickets.